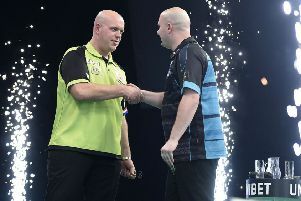 Darts superstar Rob Cross will seek to continue his red hot Unibet Premier League form during a double-header in Rotterdam over the next two days. The world champion from St Leonards will compete twice on a huge night of darts in the Netherlands today (Wednesday) and will be back in action tomorrow night. “The arena looks massive and it’s going to be special,” said Cross, who visited Rotterdam Ahoy for the first time yesterday afternoon. An additional league night at Rotterdam Ahoy was added to the Premier League schedule following March’s cancellation of the Exeter night due to the effects of Storm Emma. With Judgement Night having been moved back a week to be held in Liverpool, today’s matches in Rotterdam will form the second night of the second phase of the event. The night will see Cross, who has won seven of his last eight games, face World Grand Prix winner Daryl Gurney before returning to take on two-time world champion Gary Anderson. Cross will also play Peter Wright tomorrow to conclude a huge week for the Premier League season, and is in confident mood ahead of his first appearance in Rotterdam. He continued: “I won’t look too far ahead and I’ll take one game at a time. I’m really happy with my game at the minute so I’m really looking forward to it. Cross, the world number three, currently lies third in the table with seven wins from his first 10 matches. The action will be broadcast live on Sky Sports from 7pm BST tonight and tomorrow.